A Google Clips camera is held during a launch event in San Francisco, California, U.S. October 4, 2017. SAN FRANCISCO - Google’s announcement that it was planning to launch a smart video camera as part of its push into hardware sent shares of action camera maker GoPro Inc down more than six percent on Wednesday. It was one of a suite of new products unveiled by Alphabet Inc’s Google on Wednesday. Its move into smartphones, speakers and laptops has put the search giant into competition with Apple Inc and Amazon.com Inc. 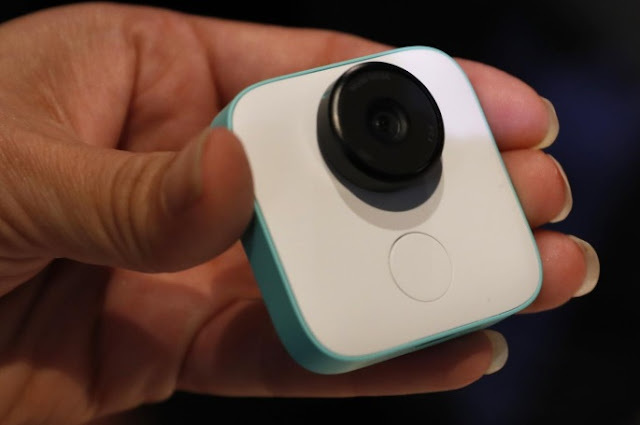 Clips, which Google said is “coming soon,” takes on compact cameras such as GoPro’s Hero5 Session and Snap Inc’s Spectacles as each strives to make the process of recording video simpler and more mobile. Google’s announcement that it was planning to launch a smart video camera as part of its push into hardware sent shares of action camera maker GoPro Inc down more than six percent on Wednesday.